Signature HealthCARE’s Department of Spirituality, the only one of its kind, is an intervention across a wide spectrum of hope, a new healing quotient beyond the tradition of good care, administered jointly, interfaced with the clinical and therapy teams. . . an actionable intervention in the care plan system. At Signature, spirituality is personalized, a spiritual input to optimize outcomes. It is the repeal of sickness and its void of depression; it is the return of hope, the belief in the impossible, the faith of what can be, the defiance of suffering, the truth of miracles and the new elixir in the care continuum. At Signature, one can choose to worship or not to worship but has the freedom to be. We do not “water down” spirituality but make available a spiritual path specific for individual discovery and conviction through the empowerment of wisdom. A company cornerstone is the interfaith Signature Chaplain Corps. Our chaplains serve through bold listening, hope and humility, striving to meet residents, employees and family members where they are, at the point of their spiritual need. 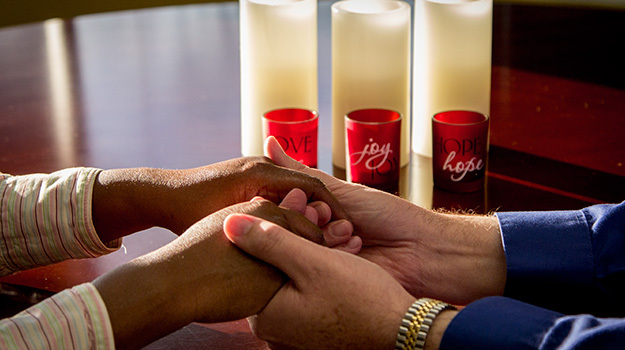 The chaplain serves not just as a service of prayer but as a clinical intervention of hope and healing. Events like our synchronized National Day of Prayer celebration for which each center organizes its own event are illustrations of our belief in the collective power of prayer.